Socorex Acura Digital Reading Manual XS 826 extra sharp micropipettes are the ideal pipettes for research laboratories! They are shorter, smoother, lighter in weight, and a range of 8 pipettes offers every user the ideal volume range. Thanks to the patented Swift-set User Calibration System users never have to pack up an Acura 826 XS to send it out for calibration service! The calibration can be performed in house with no specialized tools or expertise required. Enjoy the benefits of a softer and smoother plunger and Justip height adjustment that allows the XS 626 to fit and eject a wide variety of tips. 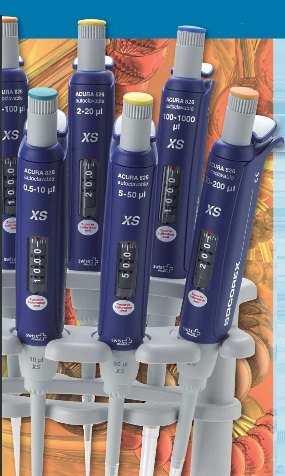 The Acura Manual XS has a unique tightness seal that reduces activation forces and provides ultra soft pipetting. 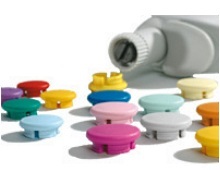 Unsurpassed performance to meet the highest pipetting requirements. The 2XS Packs are specially packaged and contain 2 each of Acura XS 826 Pipettes, 1 × Shelf Pipette Holder, Sample Tips, Operating Instructions and a QC Certificate. 320.336 Unique rotating Twister™ design 6 position universal pipette Work Station 336 for 3 pipettes, fits all Calibra and Acura pipettes as well as most other brands. Available in seven translucent colors including Rubin red, Topaz orange, Citrine yellow, Emerald green, Sapphire blue, Quartz grey and Diamond white.